This movie is based on an intriguing and fairly well-known premise: humans use only about ten percent of their brains. What would happen if an ordinary person were able to access much more? Well…first a quote from Dr. Eric Chudler from the University of Washington, author of the blog Neuroscience for Kids: “There is no scientific evidence to suggest that we only use ten percent of our brains.” And another quote, this one from George Orwell, author of, among other works, 1984. “Myths, if believed, tend to become true.” So, the movie is based on a myth; no problem, if the movie were to develop that premise in an interesting and entertaining way. It does not. Instead it becomes a mix of large on-screen graphics, African nature stock footage, zooming and swirling special effects, all connected by massive amounts of bloody violence. And really angry, one-dimensional people. 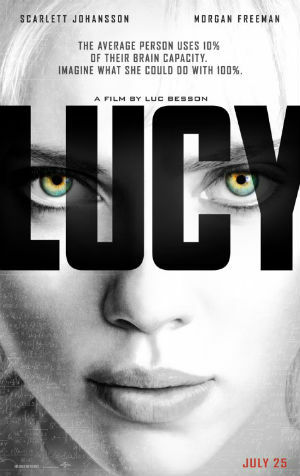 Scarlett Johansson scowls more in this movie than she’s ever done before. Most other characters wear two-piece black suits, speak Chinese, and try to kill each other. It gets old, boring, repetitious. There is blood everywhere. And often. This movie keeps doing well at the box office and I can see only one reason why: It has a strong woman in the lead role and it’s bringing lots of other women (and their boyfriends who like to watch Scarlett Johansson) into the theatre. I’m OK with strong women; I just like them to play more interesting characters in more entertaining movies. But if you ever wondered about the capacity of a thumb drive, make sure you stay for the end.